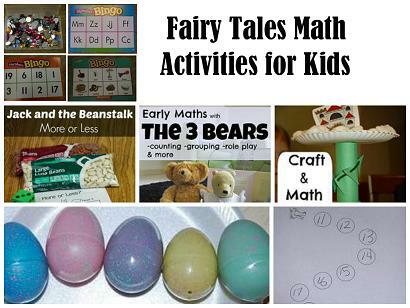 Fairy tales are stories with imaginary characters that usually have a teachable lesson. Read the story of The 3 Little Pigs to the children. Role play with the children to help them understand the morals/values embedded in the fairy tale. The underlying message behind The 3 Little Pigs – those who work hard, plan well, and use materials and resources wisely, will often be successful. We set up a sticky table to explore why some of the materials the pigs chose to build their houses were not as sturdy as others. Materials needed: Clear Contact Paper, Duct Tape (to hold the contact paper in place), yellow tissue paper – straw (cut into small squares), brown lightweight construction paper – sticks (cut into squares), red heavyweight paper – bricks (cut into squares), and a permanent marker. Cover a table with clear contact paper (sticky side up) and duct tape to hold the contact paper in place. Draw 3 simple houses on the sticky side of the paper. Ask the children to hold and examine the 3 colors of paper squares. Which paper feels the lightest? Does one kind of paper feel heavier or stronger than the other two? Allow time for the children to explore the different kinds of paper squares. Invite the children to re-tell the events of the story by using the various paper squares to decorate the 3 houses on the sticky table. Science Extension Activity: Give the children a straw and ask them to try to blow each of the paper squares across a table or the floor. Which paper square was easiest to move? Which paper square was more difficult to move across the table? 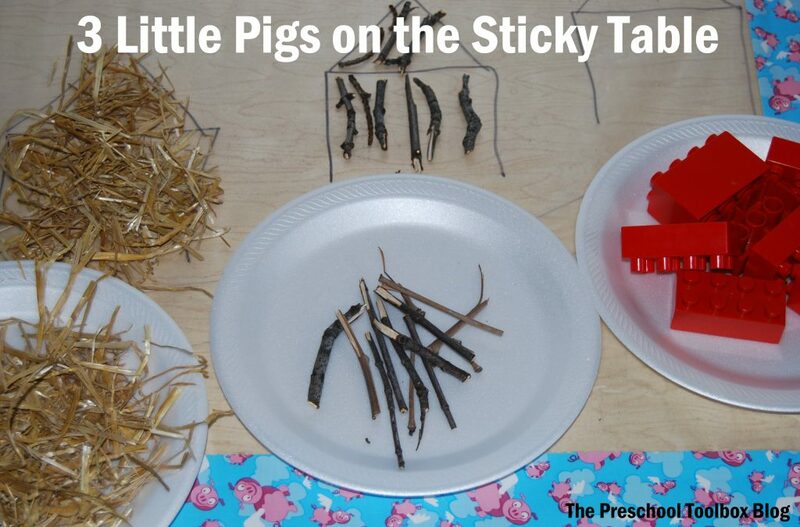 It is a fun experiment to follow the sticky table creations! Change the items used: real straw, sticks from outside, and Lego bricks are great for explorations! 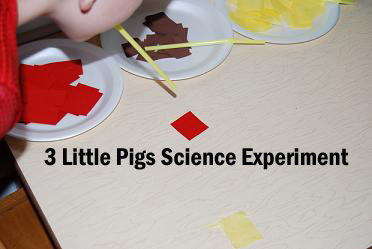 Alternate Activity: Use straw, sticks, and Lego/Duplo bricks on the sticky table and for sensory/science discoveries. 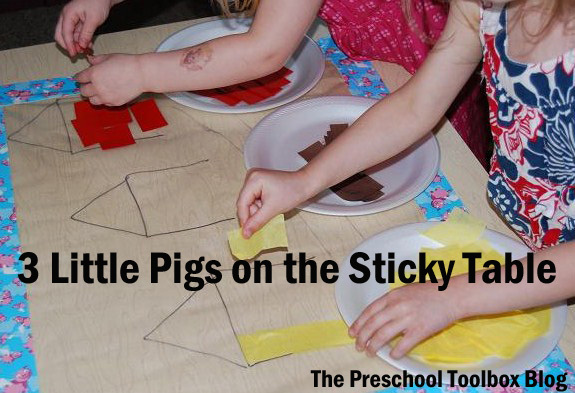 The Preschool Toolbox offers ready-made themes for playful learning at home or in the classroom. 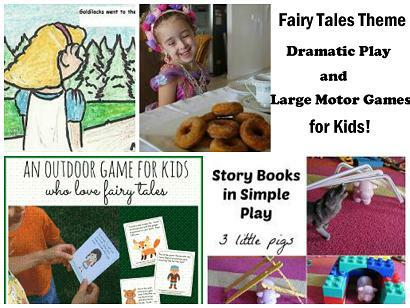 Each theme contains games and activities for Literacy, Math, Science, Large Motor, Fine Motor, Arts/Crafts, and an extensive book list in an instant download ready for YOU to use! « Dreamcatcher Crafts for Kids: No More Bad Dreams! Thanks for featuring Craftulate! So many wonderful ideas here! Georgina – great activities to feature! Thanks for stopping by and leaving a comment! Happy Friday! There are so many good ideas here that I don’t know where to start. Karen – thanks for visiting and for your comment! Thank you for inviting me into your world. Have a Super Saturday! 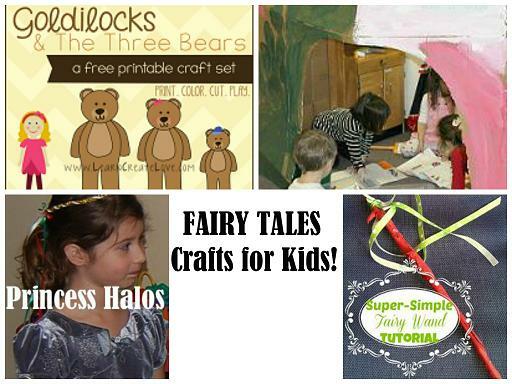 Wonderful ideas for fairy tale crafts! Can’t wait to try them. Mary – THANKS! Hope your kids like them! Love it! 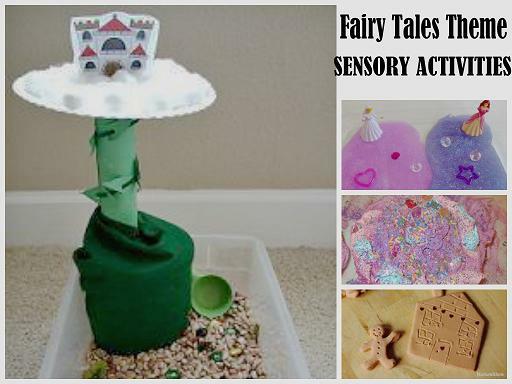 I teach Fairy Tales in my second grade class, and they’d love these activities too! Heather – I believe they would! I have a “to-be” third-grader and he tests most of our activities before our preschool kids do! :) Thanks for visiting and for your comment! 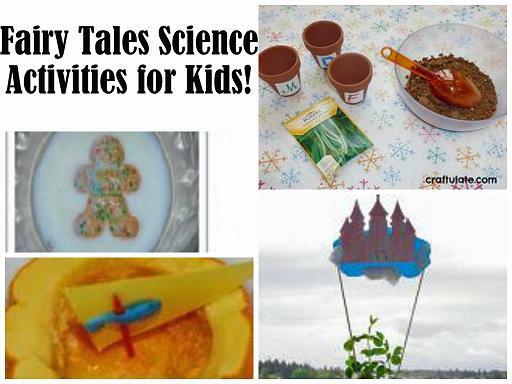 What a lot of really neat ideas for younger ones! Sharing! Michelle – thank you for visiting and for sharing! The sticky table is awesome. It kind of reminds me of the colorforms I had as a kid. I loved them! You could so the same except they could cut pictures of people or animals, houses, flowers and trees and make a picture. Thank you so much for sharing. Terri – great suggestions! Thank YOU for your comment! Thanks so much. 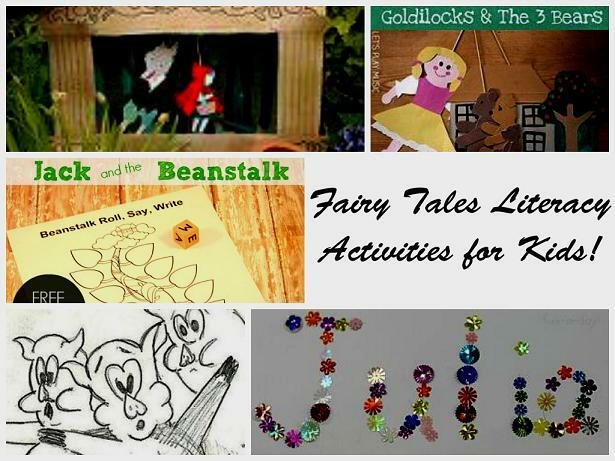 Our kids love Fairy Tales and yes, it keeps them busy and learning! These look fun, thanks for sharing! Jessica – thanks for visiting and your comment!